On March 25, immigrants and their supporters shook the halls of Congress, and, just maybe, changed history. I appreciate your contributions to Indymedia and to this struggle. Leslie - Presente! -- .- .-. -.-. --- -. .. Yes, finally someone who says it right. YOU GO LESLIE! I think the choice of sound clips is great, I've heard them and they're concerning. However, as far as I know most or all of those sound clips are from the 1990's and the visual footage was from last Saturday's march. Last Saturday's march wasn't an Atzlan march. Wasn't it said that there were more US flags displayed than Mexican flags? There were a lot of US flags displayed properly, no question there. So nice try WatchDog. From displaying the Danish cartoons depicting Muslims and Islam in a negative light to acting like middle school bullies towards day labor workers and 1inchgroup posting on SOS saying Beuna Park should be euthanized in response to the hit and run of a student protester, it seems if this type of behavior gets more and more accepted, soon it will be acceptable to be racist and insulting towards Mexicans, with the excuse that may who are here against immigration law are Mexican. The MM and their types say that their opponets call the racists to paralize their arguments. Well maybe they have had the same effect on their opponents. Like I said, the march last Saturday wasn't about the Atzlan idea, even if some guy with an Atzlan shirt was photographed there. It probably wasn't supposed to be anyways. But there doesn't seem to be much Atzlan talk going around now. It goes both ways. Otherwise if unchecked, you could have Atzlan berets at all the events and Minutemen say it's okay to have the KKK with them because of any common ground. At least both sides seem to have some kind of check on each other. Anyways, Watchdog's video is a piece of crap because the sound and visual footage does not match. 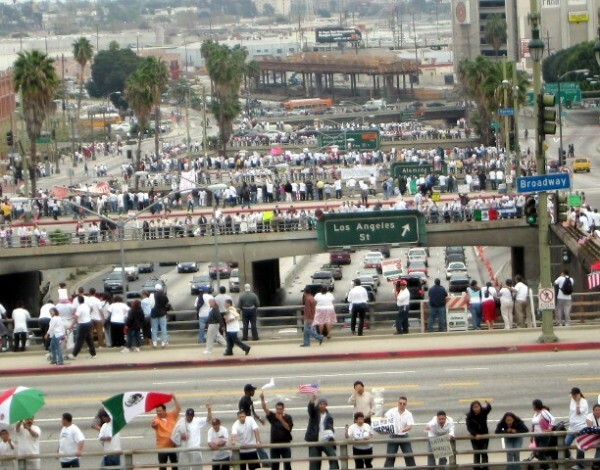 I meant with the excuse that many who are here against immigration laws are from Mexico. That's an excuse the MM use to use humor in bad taste towards those people. We need more "Leslies" to make the world a better place. 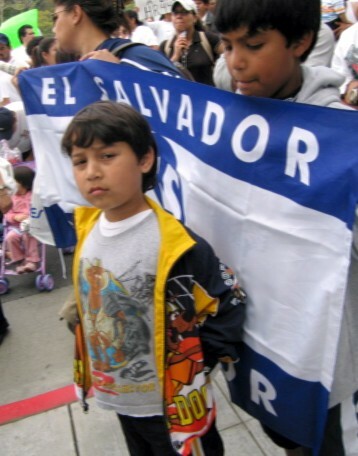 Immigrants are a permanent presence in this country. There is no serious desire OR INTENTION to expel all of the people who are here without documentation. Rather, the intent is to keep all of the immigrant workers here but to give them as few rights as possible. 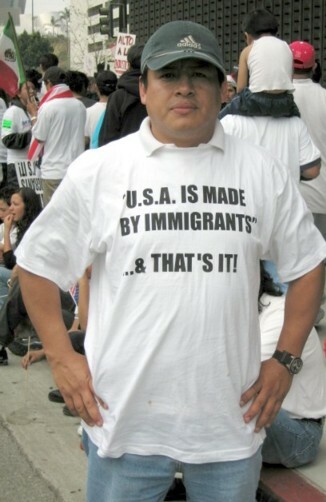 That is why we have the present hypocritical immigration "policy." Lots of screaming about shutting down the border, but in reality just creating an oppressive environment within which undocumented workers cannot easily exercise their rights to a decent wage, benefits, unionization, health care, general conditions of labor and so on. As far as I am concerned, undocumented immigrant workers are my felllow citizens, because they live here, work here, pay taxes, go to school, get sick if work or living conditions are bad, drive on the roads, and so one, just like me. So given that reality, what is the effect of creating a class of citizens with second-class rights? Also, it creates (HAS created) a large class of laborers with reduced rights that can be used to depress wages overall. To hear people blame immigrants for this is just amazing; it is blaming the victims. It is the reduced rights of these immigrant workers, not the workers themselves, that are responsible for any effects upon wages. Also, if you have a class of people who cannot access health care easily, what does that do for public health? You think a germ cares if you are newly here or descended from the Pilgrims? Just wait until bird flu hits this country, and you'll find out how wrong you are. Finally, the very HYPOCRISY of this public policy poisons democracy and pollutes public discourse. Politicians who call for sealing the border, like this joke of a governor here, are having their pockets lined by giant agribusinesses and others who would not DREAM of REALLY cutting back on immigration. They just want their labor force sufficiently TERRORIZED that they can make them work for any amount they name. How can we VOTE properly with all of these LIES floating around? Let's clear the air and adopt a consistent policy where we acknowledge reality and do what we say and say what we do. A big SHOUT OUT to all of my fellow citizens of any nationality or color who participated in this BEAUTIFUL MARCH LAST SATURDAY. 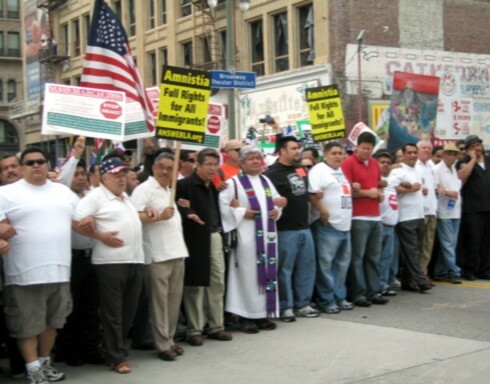 IMMMIGRANTS ARE NOW THE OFFICIAL LEADERS OF THE PROGRESSIVE AND UNION MOVEMENTS IN LOS ANGELES AND THE UNITED STATES. Have been, in fact, for some time, but this makes it official. As a gringo, I look forward to your continued leadership and to the life that new and recent immigrants are injecting into our otherwise moribund body politic. THANK YOU FOR FIGHTING FOR MY RIGHTS, TOO! If you go back to your history just a few generations you will find that the flood of immigrants that came from Eastern Europe were NOT called Illegal immigrants. WHY NOT? You'll find that instead of being confronted by border patrol and "minute men" they were simply screened for disease and then simply processed thru the gates of Ellis Island, a small immigration station that served from 1892 to 1954. Where it allowed over 22 million people from Europe to come to this country for the same reasons the immigrants of today cross our southern border, a better life. Yet why don't these immigrants of today have an "Ellis Island" of their own? SIMPLE RACISM! THAT'S WHY! As much as many people will deny it and use the excuse of TERRORISM to HIDE it, deep inside them, it's what drives them to use these immigrants as scapegoats and blame them for our nations ills. Even BEFORE 9/11 they've been pushing to militarize the border! Don't let them fool you and tell you it's for "National Security." It seems like the darker less assimilable the immigrants get and these newcomers are the more AMERICA PANICS!! It frustrates me to see how the media is orchestrating their scare tactics against the American public and how we're just chewing it all up, believing that these simple, economic immigrants are terrorist! Ridiculous. Don't you see, if the federal gov't really believed that terrorist were coming thru the border they would BE AT THE BORDER and NOT IN IRAQ! But our ever-so opportunistic gov't only allows immigrants to come here because AMERICA NEEDS CHEAP LABOR!! WAKE UP! 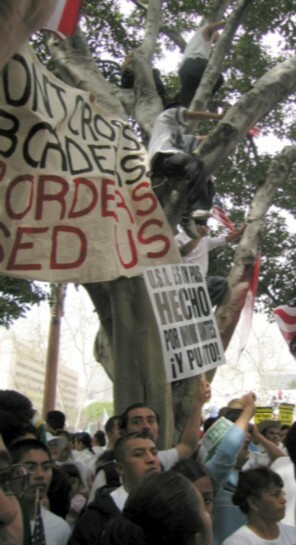 Inmigrant Singing: STOP BUSH! 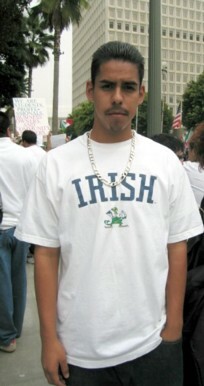 INMIGRANT RIGHTS! 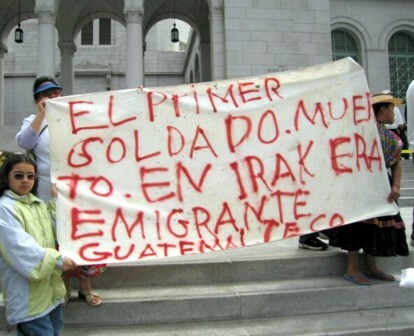 Stop BUSH now, inmigrant rights now! good articles, congratulations to indymedia. To protest on the streets i buy some tshirts at cafepress, i've found a good anti-bush t-shirt , i show you now, click HERE IF YOU WANT TO BUY ANTI-BUSH T-SHIRTS T SHIRTS MUGS CAPS AND MORE PRODUCTS , THERE ARE ANTI-CPE, CHE GUEVARA IDEAS TOO, GREAT!!! Some of us are ’illegal’ and some are not wanted. It’s six hundred miles to that Mexican border. Goodbye to my Juan, goodbye, Rosalita. 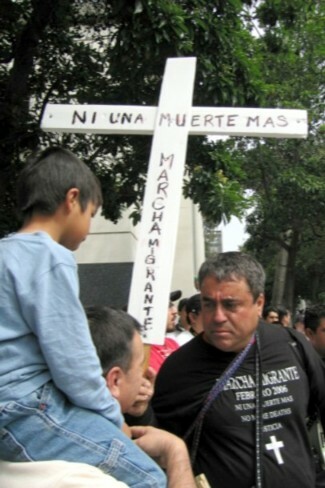 Adiós mis amigos, Jesús y Maria. You won’t have your names when you ride the big airplane. America’s best-known and best-loved proletarian troubadour penned and sang those words in the late 1940s, chronicling the plight of Mexican workers selling their labour power for a pittance in the fruit orchards, vineyards and lettuce fields of California, all the while hounded as ‘illegals’ by the same capitalist class that was reaping superprofits from their underpaid and back-breaking toil. In qualitative terms, little has really changed since then, despite a militant, sustained and genuinely heroic organising drive by the United Farm Workers’ union towards the end of the 1960s and into the ’70s. Scores of agricultural workers and union activists were imprisoned, beaten up or lost their lives in that epic class struggle and the farm bosses were ultimately forced to recognise the UFW, but only for those with papers. 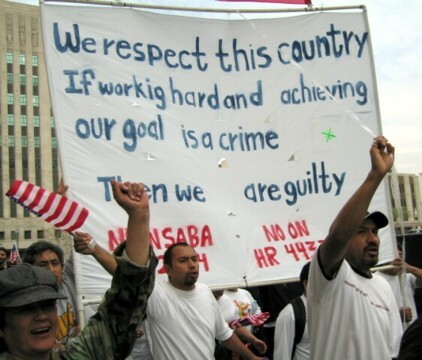 US capital has continued to benefit from the fact that the ‘illegals’ – generally referred to in progressive American circles as ‘undocumented workers’ – can be paid well below the minimum wage under threat of expulsion from the country. At the same time, expulsion is more than just a threat. Despite their thirst for cheap labour, the monopoly capitalists and their state have been prepared to placate the reactionary anti-immigrant prejudices of petit-bourgeois ‘middle America’ by conducting periodic round-ups and deportations of foreign labourers, in the agricultural sector and beyond, who have been found not to have work or residency permits. After all, with an estimated 12 million undocumented workers living in the United States, there is no dearth of people to replace those slung out of the place. Hypocrisy? Yes. Cynicism? Certainly. The normal and expected behaviour of a class whose very existence depends on sucking the blood of others? Definitely. The attentive reader will notice that we’ve begun talking of ‘foreign’, rather than just Mexican, undocumented workers here. That’s because the situation also affects Puerto Ricans in New York, the Chinese in San Francisco, Koreans in Los Angeles, Poles in Chicago … and the list goes on. 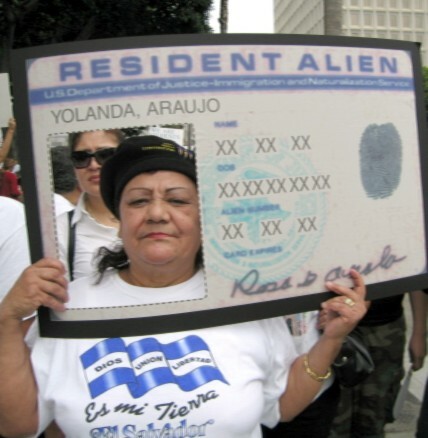 The only group of undocumented workers seemingly immune from state persecution have been the gusanos [worms], the Cubans of Miami, whose treason against their socialist homeland must be seen to be rewarded by a grateful Uncle Sam. Traditionally, most ‘illegal’ immigrants have, for obvious reasons, been reluctant to stick their heads above the parapet. Why, then, have the last weeks and months seen an unprecedented display of publicly-expressed anger and coordinated struggle involving literally millions of undocumented workers and their allies and supporters? The answer is to be found in a draconian piece of legislation currently working its way through the US Congress – HR 4437 or, to name it after the quasi-fascist Republican congressman who introduced it, the Sensenbrenner Bill. As Proletarian went to press it was not yet clear whether this bill, which originated in the [lower] House of Representatives, was going to be ratified by the [upper] Senate. A slightly less all-encompassing alternative was being considered by legislators from the more liberal, East Coast, “old money” sections of the ruling class, led by surviving Kennedy brother Senator Ted. Both houses of congress, roughly equivalent to the British bourgeoisie’s Commons and Lords, have to vote in favour of any new legislation. Then the president must sign it into law, and no doubt George W Bush (who, in his former role as Texas governor, consigned 20 times more Hispanics than whites to death row – without even broaching the subject of African-Americans!) has been practising how to spell his name just for this auspicious occasion. If brought into law, HR 4437, officially named the Border Protection, Anti-Terrorism and Illegal Immigration Control Bill, will have a number of effects – all of them thoroughly reactionary. It will make all undocumented workers ‘felons’, the highest category of criminal in the US judicial system, on a par with murderers, kidnappers and rapists -- but not the perpetrators of imperialist genocide in Iraq and elsewhere, who somehow seem to have escaped classification by the Justice Department. The bill will accord this same criminal status to any teachers, clergy, trade unionists, social workers and even family members who work with ‘illegals’. Rather than just being chucked out of the US as before, traumatic enough in itself, undocumented workers will do quite a bit of porridge before being ejected, but at least they’ll have the companionship of their friends sharing a cell with them. The proposed law will call for a wall to be built along the entire 1,800-mile length of the US-Mexico border. There’s already a fence in most places, but wire-cutters are pretty readily available, even in a Mexico that has been kept poor and underdeveloped by the avarice of US imperialism. The US zionist lobby – who needless to say support the bill to a man -- are already wetting themselves with joy at the prospect of the Bush regime replicating Israel’s own illegal barrier in occupied Palestine. Vindication and international credibility at last? We think not! Heavily-armed National Guard troops, roughly equivalent to the Territorial Army in Britain, will be deployed by each of the US states facing Mexico to complement the existing government-funded thugs of the US Border Patrol, with the net effect of thoroughly militarising the frontier. And all local and state police forces in US border areas (ie, in southern parts of Arizona, California, New Mexico and Texas) will be empowered for the first time to arrest anyone they “have reasonable cause to believe” may be without documents. Quite obviously, this will vastly increase the ‘stop and search’ of anyone with a brown skin and scare immigrants away from reporting crimes committed against them. The term ‘un-American’ was originally coined as part of the US monopoly bourgeoisie’s attack on progressives of all shades during the McCarthyite anti-Communist witchhunts of the 1940s and ’50s. In the context of the unprecedented and ongoing immigrant-led protests against the Sensenbrenner Bill (of which more in the paragraphs that follow), the perceived meaning of this famous expression has been turned on its head. 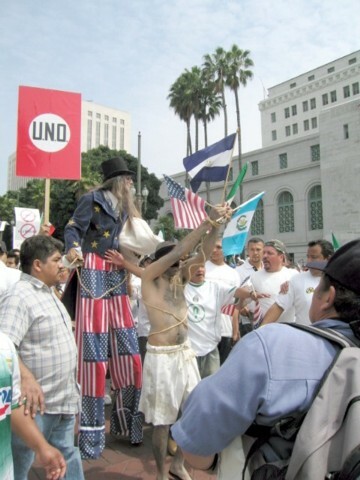 The mass protests began in the run-up to May Day 2006, with marches held in all of the main US cities plus a never-before-seen number of smaller towns throughout the country. 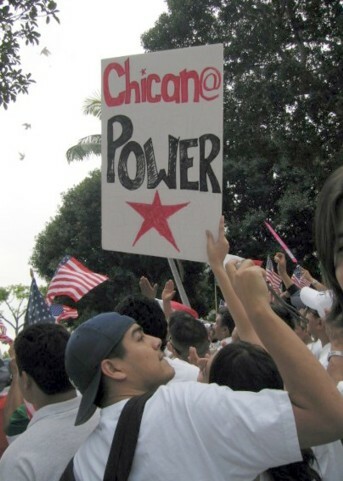 ‘No to the Bill!’, ‘Equality for all Americans!’, ‘General Amnesty for the Undocumented!’ These were – and are – the key slogans characterising what has become a protest movement of enormous proportions. One of the many great ironies of life in capitalist America is that 1 May is not officially celebrated there and nobody gets the day off. This despite the fact that International Workers’ Day originated in late 19th-century Chicago as part of the militant struggle for an eight-hour day. In fact, the American bourgeoisie’s ‘Labor Day’ in September was deliberately established as a sop, as a means of distracting the attention of the US proletariat from the significance of May Day and of establishing a ‘tradition’ of eating hotdogs and corn-on-the-cob, and playing American football in the local park – rather than challenging the existing mode of production and actively organising to get rid of it. This attempted – and hitherto largely successful – indoctrination and pacification notwithstanding, May Day 2006 in America became a non-working day, declared not by the bourgeois state but by the proletariat itself. 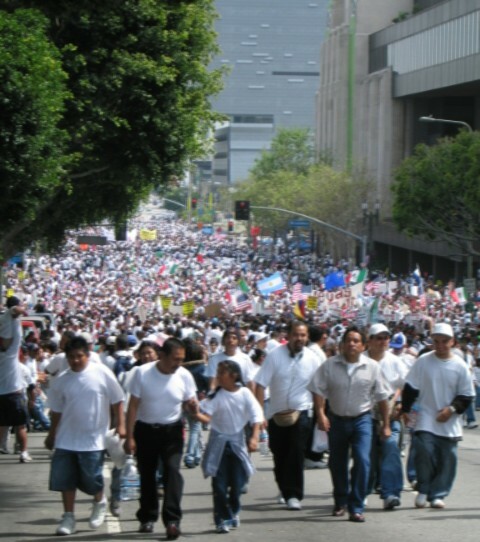 For the first time, literally millions of working-class people took to the streets. 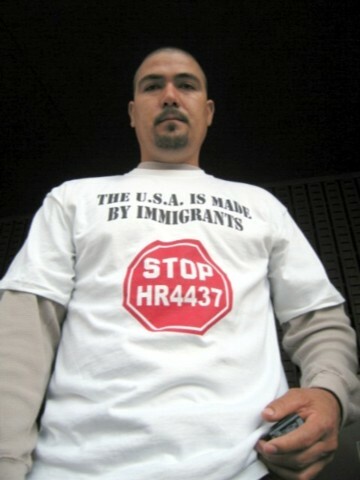 Irrespective of race, national background or immigration status, workers participated in genuinely mass demonstrations – the largest in Los Angeles at close to 500,000 people – and militant opposition to HR 4437 was the main focus. And that power, the cooperation of the wage slave without whom capitalism can no longer hope to exist, was extensively withdrawn on 1 May. Immigrant workers took an unofficial day off, ethnic minority and immigrant consumers chose not to go shopping – for anything – and students at all levels (from primary schools to post-graduate university courses) decided that expressing solidarity and building a united front on the street was more important than remaining in the classroom to learn the dates of presidents or work out how to scam their way to an ultimately meaningless master’s degree. There has also been a symbolically and directly internationalist aspect to the campaign against this new immigration clampdown. The US-Mexican border has been physically closed down twice – once by a sit-down on the part of US protestors and twice by workers on the other side of the frontier, where the threatened use of Molotov cocktails gave pause even to the US Border Patrol.